Ruby Red is a boutique hotel on the Out Of The Blue Capsis Elite Resort peninsula. The interior décor of this boutique hotel, gives great emphasis on comfort combined with a traditional Greek touch. Natural colours of Greek marble and wood, influenced by the Minoan colours, are used as the hotel’s main materials. A private collection of paintings by famous Greek artists, antique furniture, statues and decorative ornaments from Greece and around Europe blend beautifully with the local Cretan touch of this elegant property. Mini market with traditional Greek products. 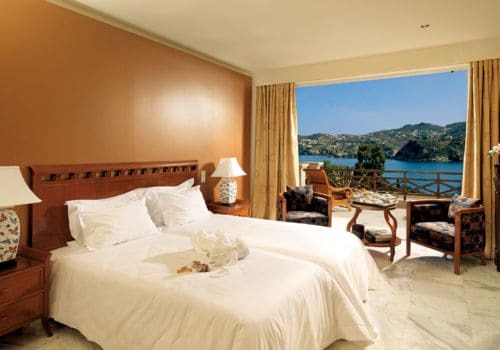 The classic and elegant rooms each offer a balcony which affords a superb pool, garden or sea view. They are decorated in a classic European style featuring traditional fabrics, stylish furniture and sumptuous marble bathrooms. The splendid Classic suites vary in size, some offering cosy sitting arrangements and others a separate lounge and dining area. Their elegant European decor and superb amenities and fittings lend these suites a truly comfortable atmosphere. Perfect for two couples or a family stay in Crete. This large suite overlooks the main pool and comprises of two double bedrooms, one living room and 2 marble bathrooms. The decor is an elegant blend of European and traditional Greek style with marble floors, Minoan style ornaments and rich fabrics. The luxury Presidential Suites are spacious and offer unparalleled Aegean Sea views from your own private terrace. Each suite includes a spacious master bedroom, a separate living room and a luxurious marble bathroom with bathtub and separate walk-in shower. 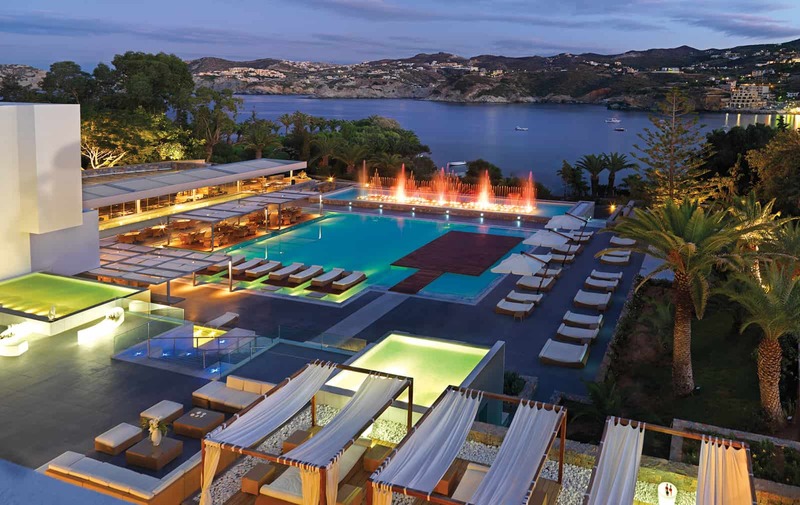 The OUT OF THE BLUE, Capsis Elite Resort is a 5-star deluxe hotel complex located on a private peninsula surrounded by a vast and luscious Botanical Garden that impresses with its beautiful Aegean views. There are a number of different hotel and accommodation styles within the resort, Ruby Red being just one of them. Located just 20 minutes from the city and airport in Heraklion, the peninsula is next to the traditional fishing village of Aghia Pelaghia. From basic bungalows to exquisite suites and villas with their own private pools, The OUT OF THE BLUE, Capsis Elite Resort is a great destination. 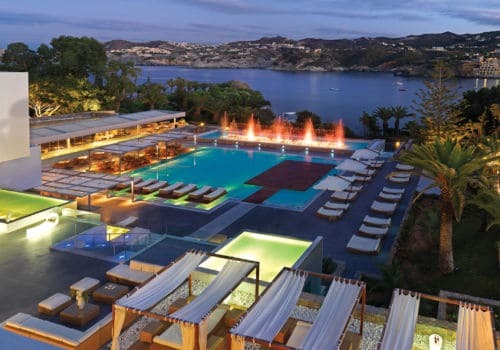 Euphoria, the resort’s stunning spa is named after the Greek word which means psychologically uplifting. The Spa offers holistic treatments and therapies that go beyond beauty and focus on health, stress-reduction, recuperation and well being by using pure and natural environmentally-friendly products. The relaxation, massage, slimming and anti-ageing treatments offer instant pleasure and long-lasting beauty results. This inviting and convivial buffet restaurant boasts a modern and comfortable decor and overlooks Cladissos private beach and the bay. It is the main restaurant of the resort and offers both indoor and outdoor sitting arrangements and serves a wide range of starters, salads, mains and desserts carefully selected to suit all tastes and appetites. The casual atmosphere of this traditional Greek restaurant, which overlooks the fishing village of Agia Pelagia, is ideal for lunch and dinner. Located on the seafront, it sits amongst pine trees, olive trees and rosemary bushes that create a picturesque atmosphere perfect to experience Cretan and Greek cuisine. Set alongside the Crystal pool, this à la carte restaurant offers a romantic atmosphere enhanced each night by a water-music-light show. Open for lunch and dinner, the H2O aqua fusion specialities combine the best of Asian & International cuisine offering an exotic and mouth-watering culinary experience. Located next to the main reception & lobby of the Exclusive Collection Hotel, this exceptional restaurant, with its magnificent view of the Aegean offers exquisite Greek creations and international gastronomic tastes and an impeccable service. Opening for Breakfast for guests staying at the Exclusive Collection and giving the option of an exterior veranda surrounded by bougainvillaeas or an elegant interior makes it an ideal choice for an ultimate breakfast. The Safran is an Italian restaurant offering a unique cliff setting affording spectacular Aegean Sea views. This splendid restaurant was awarded a Gourmet prize, by the Greek newspaper “Eleftherotipia”, for its creative cuisine. Open to all guests for lunch and dinner it serves delicious seafood and Italian specialities.